Heat the oil to approximately 350 degrees. We have a fry-daddy, which is a simple deep-fryer without a temperature setting, and it works beautifully. All we do is plug ours in. Thinly slice the potatoes, and try to get them to a uniform size. A mandoline slicer (on our wish-list) would be a great tool here. Using Trader Joe’s confetti potatoes is a nice touch – new, red, and purple potatoes are small and delicious. Once the oil is hot, blanch* the potatoes. (You may need to do this batches). To blanch the potatoes, fry them for approximately 5-6 minutes (for the small potatoes, or 7-8 for larger fries). Remove from the oil and let them rest. When you’re ready to eat, place the potatoes in the hot oil again for another 2-3 minutes. Remove from the oil and place on a plate lined with a paper towel. Sprinkle generously with salt, serve immediately, and ENJOY! *Why blanch the potatoes first? 1. Because Anthony Bourdain says so. 2. Because Anthony Bourdain says this is the key to getting that great crisp texture. Just frying them once leaves the fries mushy and limp. The steak pictured above is one of the, if not the best steak we’ve ever tasted. This isn’t really a recipe- just some steak advice. Picking Out Your Steak: We bought our steaks from our favorite butchery. For four people, we got two new york strip steaks cut an inch and a quarter thick. We opted for the local, grass-fed, anti-biotic free steaks. For those of you who roll your eyes at those buzz-words, trust us and give it a try. You’ll be pleasantly surprised. Seasoning: Salt and pepper. Get the steaks out of the fridge a good 30 minutes before cooking and season them then so that the seasoning can soak in a little bit. Resting: Especially if you’re going to split larger cuts of meat like we did, make sure to let you steaks rest for 10 minutes under tin foil before cutting them up. This lets the juices re-settle to perfect the steak. Company: All of this should be done with great friends. Drink good beer while grilling and drink better wine when eating. 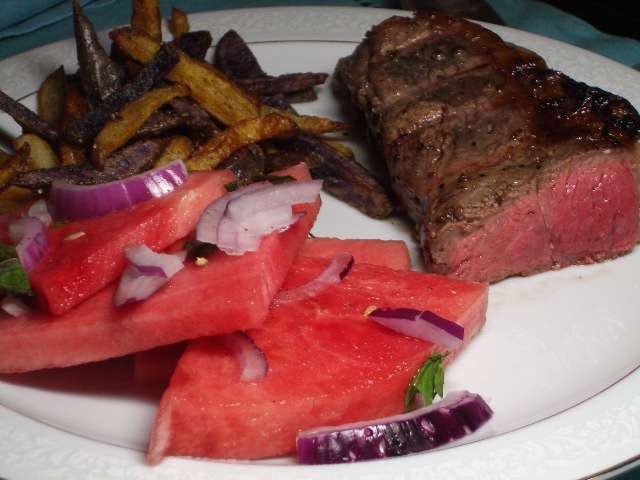 We had a watermelon, onion and mint salad as a fresh accompaniment to the heavy steak frites. 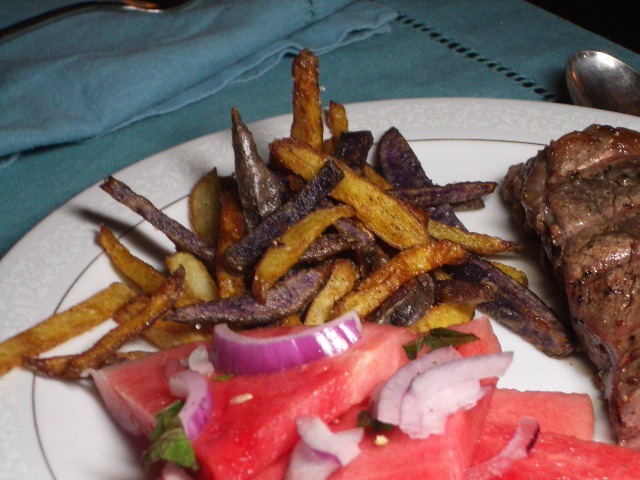 Slice watermelon, throw in some thinly sliced red onions, and top with some torn mint leaves.